This Kale Caesar Salad may just be the best thing since we discovered kale chips! 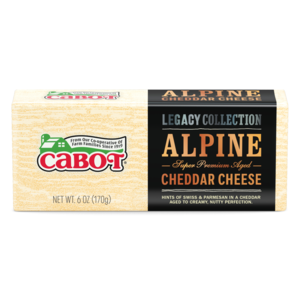 We love the way the Cabot Alpine Cheddar is so creamy and nutty when combined with the fresh lemony kale. This salad is terrific whether enjoyed as a side dish (recipe makes 8 side servings) to accompany a simple chicken or fish meal, or as the main entrée (recipe makes 4 entrée servings). Once you’ve made this salad, share the recipe with family and friends on Facebook, Pinterest, Instagram, and Twitter! 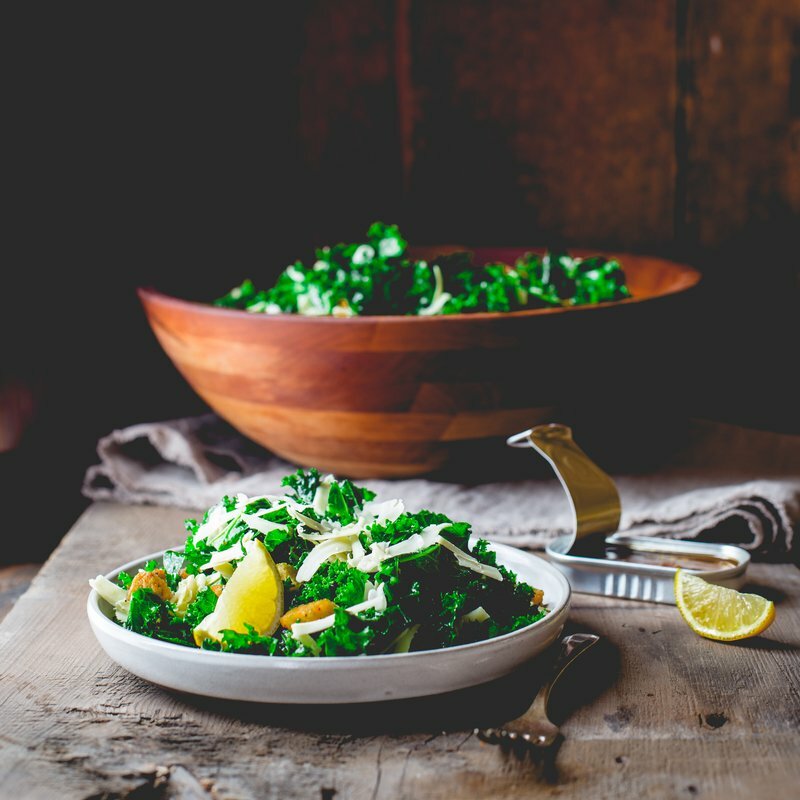 Begin by placing kale in a large salad bowl and drizzle with 2 tablespoons of extra virgin oil. Toss with clean hands to coat and massage the oil into the kale leaves until the leaves become completely coated and slightly translucent, about 5 to 6 minutes. Taking these extra few minutes to massage the kale with the olive oil helps to tenderize it and makes a huge difference in the texture. Next, sprinkle kosher salt over smashed and peeled garlic. Chop and mash garlic and salt together, using a chef’s knife, until a paste is formed. Add anchovies and continue chopping and mashing to make a paste. Scrape the mixture into a small bowl, add lemon juice and Dijon, and stir to loosen the mixture. Add the remaining 2 tablespoons of olive oil, stirring to combine. Drizzle the dressing over the kale and toss until thoroughly combined. Add shredded Cabot Alpine Cheddar, croutons, and pepper, and toss again to combine. When you’re in the mood for another kale and cheddar salad, make our Kale, Apple, and Cheddar Salad. Cabot is owned by 800 farm families who work hard to ensure that all of our products are made using only the finest ingredients. That’s why we’re confident that you’ll love this kale caesar salad. We’d love to hear your thoughts so, if you’d rate and review the recipe after trying it out, we’d really appreciate it! PLACE kale in a large salad bowl. Drizzle with 2 tablespoons oil and toss with clean hands to coat. Massage the oil into the kale leaves until the leaves become completely coated and slightly translucent, 5 to 6 minutes. CHOP garlic. Sprinkle salt over garlic and chop and mash with chef’s knife until it forms a paste. Add anchovies to the pile of salt and garlic and continue chopping and mashing to make a paste. Scrape the mixture into a small bowl. Add lemon juice and Dijon and stir to loosen the mixture. Add the remaining 2 tablespoons oil and stir to combine. DRIZZLE the dressing over the kale, and toss with tongs until thoroughly combined. Add Cabot Alpine Cheddar, croutons and pepper and toss until thoroughly combined.